Viking hit a home run with the 53 Convertible from her striking profile, high-end accommodations, and great performance. Three Buoys has 120k invested in her in the last 2 years bringing her up to date with both maintenance and upgrades. She is sure to impress cruisers and sports fishermen alike. 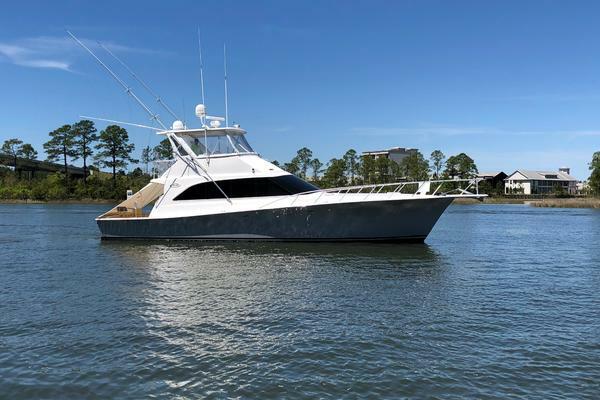 At 53' she fits right in the sweet spot for owner-operators or with a crew as well. Come see what this great boat has to offer. West Florida Yachts would love to guide you through a personal showing of this 53' Viking 53 Convertible 1992. This yacht for sale is located in Fort Lauderdale, Florida and priced at $199,000. For a showing please contact us by filling out the form on this page and we will get back to you shortly! Three Buoys is a 53 Viking convertible that is equally at home cruising or chasing big fish out in the canyons offshore. She has a timeless solid teak interior with a semi-gloss finish. The salon is open and airy with an on-deck galley, dinette and wet bar. Below you will find a 3 stateroom, 2 head layout that allows you to bring the whole group. The midship master features a large island berth for 2 with a private ensuite head that has a shower and seat. You will find a bunk room to port comfortable for even your largest guest and plenty of storage for all of their things. Just forward on the port side, you will find the washer dryer ensuring you are always looking your best. Moving all the way to the bow there is a full head that can be accessed from the companionway or thru the vip guest stateroom. The VIP guest stateroom features oversized bunks and plenty of storage. Outside you will find a cockpit with freezer, bait station, tackle center, fish boxes and saltwater washdowns. The flybridge is large with lots of seating and updated electronics. When you step in the salon you are greeted with a large sofa to port, wet bar to starboard and the stereo system. Moving just forward to straboard you have a dinette which makes the perfect place to grab a bite and to port the Galley. The galley has new teak and holly flooring and features a full-sized refrigerator, microwave, sink with garbage disposal, and cooktop. The helm of Three Buoys has a lot to offer in both space and amenities. 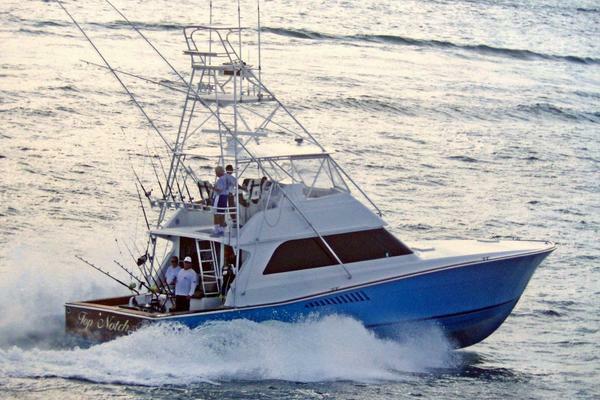 The large cockpit has everything you would expect in a sportfish this size and more. The engine room is accessed through the cockpit and large enough to make working on the machinery easy.